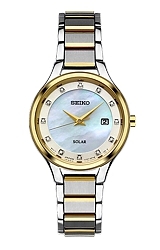 The beautiful Seiko Women's Diamond Dial SOLAR Watch looks perfect on any wrist! Designed with a genuine mother of pearl dial and diamond hour markers, this solar dress watch with date is perfect for day to day wear no matter what the occasion. Model SUT318 features a Two-tone Stainless Steel Case that matches any jewelry wardrobe. The dial is easy-to-read at a glance and the watch is not too large, just about 1 inch in diameter.